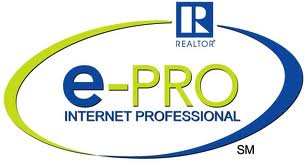 e-PRO® offers the most up-to-date real estate technology training. Ten years ago the National Association of REALTORS® (NAR) developed the e-PRO® certification program to teach members how to effectively use real estate technology to grow their business. The National Association of REALTORS® has partnered with the Social Media Marketing Institute (SMMI) to develop an entirely new e-PRO® program to help you successfully compete in today’s ever-evolving real estate market. Internet and Technology Real Estate Certification.